The 2017 Cheltenham Champion Hurdle winner had a handy afternoon in the Fighting Fifth Hurdle at Newcastle. Geraghty and Buveur D'Air (file photo). BUVEUR D’AIR LOOKED impressive on his comeback at Newcastle today. The Nicky Henderson-trained six-year-old, who won the Cheltenham Champion Hurdle back in March, was making a season debut in the Fighting Fifth Hurdle. And jockey Barry Geragthy had very little work to do as the 1-6 favourite effortlessly saw off runner-up Irving (9-2) and third-placed Flying Tiger (9-1). “It was really good, Geraghty told At The Races. “His jumping is just… he’s rapid. “If you look over the years at the real champion hurdlers with Istabraq, Hurricane Fly, Hardy Eustace… they just bend their knees. They gain ground but they also get to fill up their lunges because it’s so natural and easy for them. I rode him 10 days ago in Newbury and he worked nicely. He worked on Sunday morning and Nicky was buzzing about him. He was very happy with his weight, which is a good indication. Email “'The champion is back!' - Buveur D'Air claims comfortable victory on season debut ”. Feedback on “'The champion is back!' 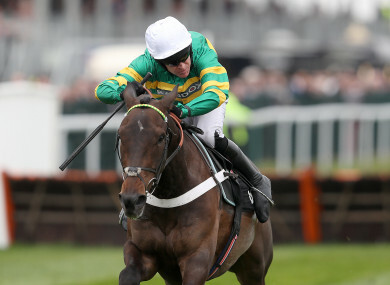 - Buveur D'Air claims comfortable victory on season debut ”.